Ivar Johan Haglund was born in Seattle, Washington, the son of pioneers Johan Ivar Haglund, a Swedish immigrant and Daisy Hanson Haglund, daughter of Norwegian immigrants. His maternal grandparents had purchased Alki Point in 1869 from Seattle pioneer David Swinson Maynard. The house on the property, which is now located at 3045 64th Avenue SW in West Seattle, is considered to be the oldest house in Seattle. His mother died of starvation when he was only three on February 26, 1908, while under treatment by Linda Hazzard, a so-called fasting specialist. However, following autopsy, it was determined that his mother had been suffering from terminal stomach cancer, possibly for years, and that she would have died even without Hazzard's "treatment". The official cause of death was reported as stomach cancer. 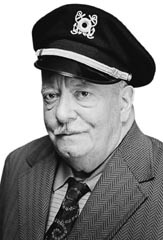 Ivar himself was treated by "Dr." Hazzard several times after his mother's death, likely due to his father's belief that Hazzard's treatment had eased his late mother's suffering and extended her life. In 1938, he opened Seattle's first aquarium along with a fish and chips counter on Pier 54. Friends who visited him included novelist Thomas Wolfe (1900–1938), one of whose last photographs was taken in the company of Haglund in July, 1938. In 1946, Haglund opened a full restaurant on Pier 54, Ivar's Acres of Clams, which with the fish and chip counter survives to this day (although they have been thoroughly remodeled). He coined its motto, "Keep Clam." He expanded the fine dining and fish and chips restaurants into a regional chain. In 1965 he bought Pier 54. 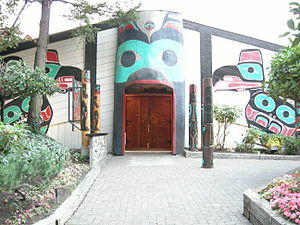 Ivar's Salmon House opened in 1971. 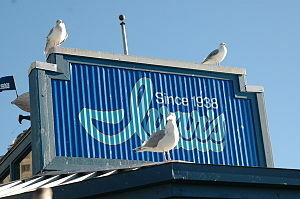 The 1980s saw the addition of multiple Ivar's Fish Bars. Today, there are 24 Ivar's fast casual Seafood Bars, three Fish Bars, and three full-service restaurants: Ivar's Acres of Clams, Ivar's Salmon House and Ivar's Mukilteo Landing. After his neighbor on Pier 56 put up a sign reading "Don't Feed Sea Gulls, Health Regulation" in 1971, Haglund responded with his own sign encouraging customers to feed the seagulls. In 1976, Haglund bought the Smith Tower, a Seattle landmark that was once the tallest building in North America west of the Mississippi River. In 1983, he was elected port commissioner after filing as a prank. He died of a heart attack just over a year later. With no direct heirs, he left his estate principally to the University of Washington School of Business in support of the University Restaurant Program . 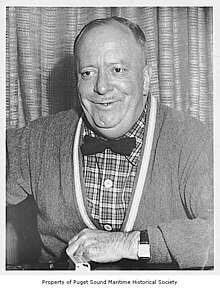 ^ a b c d e Haglund, Ivar (1905–1985), (Paul Dorpat, HistoryLink, June 20, 2000) Accessed January 29, 2008. ^ "Our Story – Ivar Haglund". Ivar's, Inc. Retrieved January 1, 2016. ^ Lacitis, Erik (3 November 2011). "Washington State Death Records for King County". Washington State Archives. Retrieved 3 November 2011. ^ "Starvation Caused Woman's Death: Condition of Stomach Made it Impossible for Ms. Fannie Haglund to Retain any Food Whatever for Weeks". Seattle Daily Times. February 27, 1908. ^ Gale Fiege (September 13, 2015). "Exhibit tells the many tales of Ivar Haglund". The Daily Herald Co., Everett, WA. Retrieved January 1, 2016. ^ Scott Sunde (March 20, 2015). "Happy birthday, Ivar". Hearst Seattle Media, LLC. Retrieved January 1, 2016. ^ Lacitis, Erik (12 November 2009). "Ivar's undersea billboards a hoax devised as marketing ploy". The Seattle Times. Retrieved 3 May 2011. Photo of Ivar Haglund on the site of his alma mater, the University of Washington (class of 1928). Some of Ivar's 1950s radio ads. This page was last edited on 18 February 2019, at 23:36 (UTC).